Khao Yai and Beyond comes from Deaw's love of his local jungle and a desire to share the 'real jungle' with others. Our overnight tours and trekking take place in the Western side of the National Park and far away from the main tourist routes. Our wish is to give people an experience of what the real, remote jungle is like. Poaching can be a big problem for Thailand's wildlife and it has long been Deaw's dream to give local people an investment in protecting the wildlife rather than hunting it. On our treks into the jungle we employ local people (many former hunters) as trackers and ensure that tourist money is spent at grass routes level. ​Deaw was born and brought up on the edge of the Khao Yai National Park. 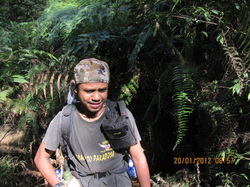 Always a lover of trekking and wildlife, he has spent his life exploring and enjoying the jungle. ​Deaw graduated with a degree in Travel and Tourism in 2005. While he is licensed to guide people worldwide, he prefers to share his enthusiasm for his local area with visitors. As your guide, Deaw will ensure that your visit to the jungle will be an authentic and unique one.